The breed standard mentions about disposition” affectionate, obedient, tractable, alert, faithful and reliable. The breed standard also mentions “intelligent expression and lively temperament”. And this intelligence and temperament should not be underestimated. Shepherd Dog has a strong sense of ranking. the true shepherd and farm dog needed. farmer had sold the lambs and they had been taken elsewhere. moods in the home. A strong “no” will mean more to the dog than jerking it’s chain. develop into an enjoyable companion. The Longhaired Dutch Shepherd Dog is mostly a family dog and usually gets along well with children. Proper training and education is required to allow this dog to develop its character to the fullest. Most of them aren't dog aggressive and get along well with other pets, especially if they're raised together. They are very sensitive to atmosphere and emotions and can be ruined by overly harsh training. owner has to give stable, consistent guidance to the dog. 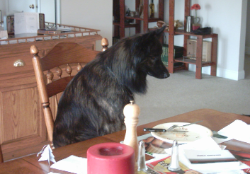 The Longhaired Dutch Shepherd is a colorful breed and will fit into many different environments. They may be difficult to find, but a good one is well worth having.